A visit to the other White House offers a preview of Donald Trump’s America. I was somewhere in between… and the Secret Service seemed a little unnerved. 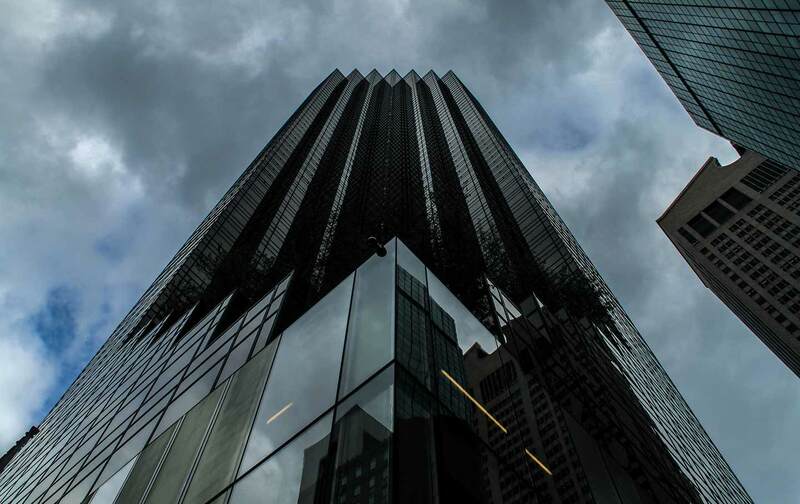 When planning for the tower began in the late 1970s, Trump—like other developers of the era—struck a deal with the city of New York. In order to add extra floors to the building, he agreed to provide amenities for the public, including access to restrooms, an atrium, and two upper-level gardens. When I arrived at Trump Tower, less than a week after Election Day, the fourth-floor garden was roped off, so I proceeded up the glass escalator, made a right, and headed through a door into an outdoor pocket park on the fifth-floor terrace. Just as I entered, a group of Japanese tourists was leaving and, suddenly, I was alone, a solitary figure in a secluded urban oasis. Taking a seat on a silver aluminum chair at a matching table, I listened closely. It had been a zoo down on Fifth Avenue just minutes before: demonstrators chanting “love trumps hate,” Trump supporters shouting back, traffic noise echoing in the urban canyon, the “whooooop” of police sirens, and a bikini-clad woman in body paint singing in front of the main entrance. And yet in this rectangular roof garden, so near to America’s new White House in waiting, all was placid and peaceful. There was no hint of the tourist-powered tumult below or of the potentially world-altering political machinations above, just the unrelenting white-noise hum of the HVAC system. The Stars and Stripes flies above the actual White House in Washington, DC. Inside the Oval Office, it’s joined by another flag—the seal of the president of the United States emblazoned on a dark blue field. Here, however, Old Glory flies side by side with slightly tattered black-and-silver Nike swoosh flags waving lazily above the tony storefronts—Louis Vuitton and Saint Laurent, Burberry and Chanel—of Manhattan’s 57th Street, and, of course, Trump Tower tenant Niketown. That I was standing beneath those flags gazing down at luxe retailers evidently proved too much to bear for those who had been not-so-subtly surveilling me. Soon a fit, heavily armed man clad in black tactical gear—what looked to my eye like a Kevlar assault suit and ballistic vest—joined me in the garden. “How’s it going?” I asked, but he only nodded, muttered something incomprehensible, and proceeded to eyeball me hard for several minutes as I sat down at a table and scrawled away in my black Moleskine notepad. My new paramilitary pal fit in perfectly with the armed-camp aesthetic that’s blossomed around Trump Tower. The addition of fences and concrete barriers to already clogged holiday season sidewalks has brought all the joys of the airport security line to Fifth Avenue. The scores of police officers now stationed around the skyscraper give it the air of a military outpost in a hostile land. (All at a bargain basement price of $1 million-plus per day for the city of New York.) Police Commissioner James O’Neill recently reeled off the forces which—in addition to traffic cops, beat cops, and bomb-sniffing dogs—now occupy this posh portion of the city: “specialized units, the critical response command, and the strategic response group, as well as plainclothes officers and counter-surveillance teams working hand-in-hand with our intelligence bureau and our partners in the federal government, specifically the Secret Service.” The armed man in tactical gear who had joined me belonged to the latter agency. Joe asked if there was anything he could do for me, so I wasn’t bashful. I told him that I wanted to know what his job was like—what it takes to protect President-elect Donald Trump and his soon-to-be second White House. “You do different things. Long hours. Nothing out of the ordinary. Probably the same as you,” he said. I told him I really doubted that and kept up my reverse interrogation. “Other than talking to me, what did you do today?” I asked. Back on the fifth floor, a metal plaque mounted on an exterior wall lays out the stipulations of the POPs agreement, namely that this “public garden” is to have nine large trees, four small trees, 148 seats, including 84 moveable chairs, and 21 tables. None of the trees looked particularly large. By my count the terrace was also missing three tables—a type available online starting at $42.99—and about 20 chairs, though some were stacked out of view and, of course, just two were needed at the moment since Mr. Tactical Gear remained standing, a short distance away, the whole time. This tiny secluded park seemed a world away from the circus below, the snarl of barricades outside the building, the tourists taking selfies with the big brassy “Trump Tower” sign in the background, and the heavily armed counter-terror cops standing guard near the revolving door entrance. Descending the switchback escalators, I found myself gazing at the lobby where a scrum of reporters stood waiting for golden elevator doors to open, potentially disgorging a Trump family member or some other person hoping to serve at the pleasure of the next president. Behind me water cascaded several stories down a pink marble wall, an overblown monument to a bygone age of excess. Ahead of me, glass cases filled with Trump/Pence 2016 T-shirts, colognes with the monikers “Empire” and “Success,” the iconic red “Make America Great Again” one-size-fits-all baseball cap, stuffed animals, and other tchotchkes stood next to an overflowing gilded garbage can. Heading for the door, I thought about all of this and Joe and his commando-chic colleague and Trump’s deserted private-public park, and the army of cops, the metal barricades, and the circus that awaited me on the street. I felt I’d truly been given some hint of the future, a whisper of what awaits. I also felt certain I’d be returning to Trump Tower—and soon.